Here’s another blog entry you can read or listen to as I recorded it for the Grantcast. If you want to subscribe to the Grantcast, you can do so with iTunes, or by using this feed in your favorite podcatcher. Enjoy! Dan, Jeanette and I discussed the different possibilities of achieving this and suddenly we hit upon the idea of, while the other seniors were toilet papering the outside of the school, what if we toilet papered the inside? This idea excited us all but we quickly realized that we couldn’t just break into the school and, on top of that, the school did have an alarm. Then a guardian angel appeared. Now, I will not reveal who this guardian angel was but I will say it was someone who was very knowledgeable about the the workings of the alarm system of the school. Not how to disarm it, but just which areas of the school were alarmed and which areas were not. We were told that a large open hallway area between the band room and two english classrooms were not alarmed and that would be our best bet as a place to wreak our TP mischief. This angel gave us a map showing which doors and windows to stay away from and even discreetly hinted at how we could enter the building without a key or breaking any windows. We were all set. The night before school we drove to the campus and drove right past all the other seniors TPing the front of the building. We drove back around to the band room and parked and found our way to the secret entry point. In seconds, we were in. We knew going in, that the hallway would be harder to toilet paper than a bunch of trees, so we brought a long scotch tape to help us hang the toilet paper from he walls. Also Jeanette, being crafty, made some hilarious signs to hane above the doors of the classrooms. English teacher Mr/ Morgan got ‘Glen’s Pad.” Mrs. Caret got ‘Elaine’s Bungalo of love.” The band teacher, Mr. Kimura, got ‘Mr. K’s,’ which was also the name of a local nightclub in burlingame. We spent about an hour making everything perfect and, when we were finally satisfied, to honor the moment, we snapped a few pictures of our handiwork and carefully snuck out of the building and into the night. The next morning I was so excited to get back to school to see the reaction of the people as they walked into the band room area hallway, I parked and made a bee line to the door to the hallway. I ran up to the door, flung it open and…the entire hallway was spotless. There wasn’t a square of toilet paper anywhere. The signs were gone from above the doors. It was your average, everyday hallway. I was crestfallen. Jeanette and Dan arrived and they too were majorly bummed out. We had worked so hard. Apparently, what had happened is the janitors had arrives earlier, found the mess and cleaned it all up before anyone else arrived. Insert sad trombone sound here. Not to be deterred in letting people know what we had done, I wrote an anonymous letter to the Burlingame B, the school’s newspaper telling everything that had happened. And I included one of the pictures of the toilet paper hanging in the hallway. The letter ran and the world knew. But it would have been much better had they seen it with their own eyes. I read the printed letter and the picture accompanied it. Under the photo, a byline, Photo by Grant Baciocco. Oops. Maybe I should have just shut up about it. I was never punished or anything. But that was the story of the one time the inside of Burlingame High School was toilet papered. 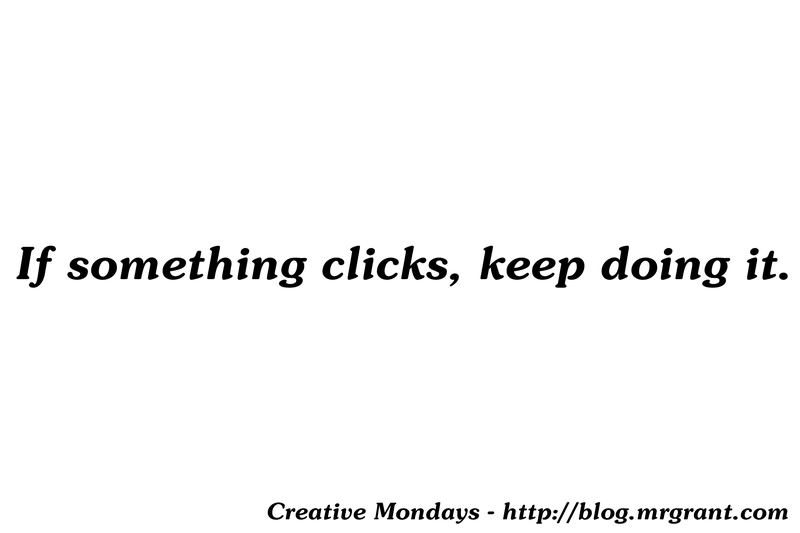 Creative Mondays #011 – If something clicks, keep doing it. When I began training to be in The Jim Henson Company’s Puppet Up, part of the training was improv classes. After taking those classes for a while, I started taking classes outside of Henson, through The Imrpovatorium. Most of my classes were with Patrick Bristow but I had a few other teachers as well. One class I took was a long form improv class with Ted Michaels. Ted is a brilliant improviser and he is also a member of Puppet Up. Ted is a great teacher and knows a lot of great structures to help drive home the core concepts of improv. I don’t remember the exact name, but one of the structures we did really hit me as being funny and, as I was thinking back about it today, the principles of it can be applied to creativity. The improv scenes started out just like most other improv scenes. Two people got a suggestion and then began the scene. The rule of this game was to go through the scene as normal until the first big, whole audience, laugh. Then, whatever it was that got that laugh, the two improvisers just keep doing that. The point being that if you keep following that first big laugh, most of the time the scene will continue to be really, really funny. I’ll give you an example. My friend Chris and another improviser were doing a scene that involved them getting into a car. Once inside the car, Chris made a move to roll down the car’s window. Of course, he was ‘space-working’ or miming it because there wasn’t a car on stage. So Chris made the move to roll down the window but his move was just really weird and not how you would go to roll down a real car window. It was funny because the audience immediately thought, “What kind of crazy wind controls does this car have?” That move got a big laugh. So Chris and his partner just went on with the dialogue as normal, but everything in the car, turning on the radio, opening the sunroof, pushing in the cigarette lighter, became these really big awkward physical movements. The scene was so funny. As the class continued, time and time again it was proven that if you just kept following that one thing that tickled the audience, the scene will succeed. Of course there were exceptions to the rule, but for for the most part, it worked. Now, another improv teacher I’ve had would agree to an extent. I believe he would say you should pursue what the audience feels is funny, yes, but be aware when they are ready to move on to something new. Then look for the next thing and follow that. I think this theory or pursuing what ‘clicks’ with the audience can be applied to creative work as well. If you find that you create a piece of art that really clicks with your audience, follow it. Keep creating in that manner. Now I’m not saying paint the same painting over and over again, but if you find a style that hits with your audience, keep creating in that style. If you’re a writer and a story or book hits, write another with the same characters or in the same universe. If a sculpture you create is a hit, create in the same style for the next one. Follow what clicks with your audience. I’m also not saying never create in another way again, that would be boring. But if you find something that works, go with it until it doesn’t work anymore and then try something else. I can point to an example of this in The Radio Adventures of Dr. Floyd. In 6 seasons of the show we followed the same ‘time travel’ formula. Dr. Steve wanted to steal historical artifacts and Dr. Floyd tried to stop them. After six seasons I wanted to try something else. Shake up that formula a little. So I created a season long storyline where Dr. Floyd and Dr. Steve got trapped inside classic literature. Now, I think these were some of our most fun shows and showed that the Dr. Floyd characters could still exist in another format. Some in the audience didn’t think so. While many folks loved Season 7, we got plenty of feedback from folks who missed the time travel formula we had done over the previous seasons. So, you’d better believe we brought it back for what was the eight and final season. Dr. Floyd really clicked with people and I followed it until it was impossible to do so anymore due to issues that arose between myself and the other co-creator of the characters. Since then, I’ve created other similar style projects and some of that audience stayed with me. True, many want Dr. Floyd to return, but that’s just not possible now. But those who like the way I produced audio drama have followed and, I hope, they aren’t disappointed as I’m still creating in the same style. I’ve set up Saturday Morning Theatre as sort of a testing ground where I can produce different types of shows and if one of those shows really clicks, I can run with it and produce more. The Tales Deputy Guppy seems to have a pretty good fan base, so there will definitely be more episodes of that. The Adventures of The Thunder Crester got sort of a lukewarm response, so I may make a few more episodes to wrap up the storyline, but I probably won’t be producing more seasons of it. If something clicks with your audience, keep doing it. Have you ever had something click with your audience? If so, what did you do? Did you follow it or try something different? Let me know in the comments below.